In the late afternoon on January 28th, 1989 at 3:07 PM EST in West Palm Beach, Florida Jaclyn made her debut on the stage of life. The sign of Cancer rising in the east at 2 degrees 9 minutes, with the wounded healer Chiron at 2 degrees 13 minutes Cancer retrograde nearly exact to her Ascendant within 4 minutes arc. Beginning her life with a seemingly blank slate ahead of her, and yet she has a­­ natal chart that is the seed of all her astrological potentials in life. So, which is it? Fate or free will? Or perhaps it is a combination of both, and growth comes down to the choices she makes and what she may perceive as fated experiences. Your parents may be under items of fate. Jaclyn’s parents do play a significant role in her life for what she is given around culture, language, and beliefs. For everyone, your response to experiences are part of your growth and your choices matter. Jaclyn has reached the age of 30 at the end of January 2019. Her Sun is at 8 degrees and 53 minutes Aquarius and her Mercury is at 0 degrees 21 minutes Aquarius retrograde in her 8th house of her natal chart. Her Moon in Libra also in an air sign is at 25 degrees 10 minutes Libra in her 5th house. Our initial conversation was in January of 2018 and now finishing the part one of her Saturn return story. Jaclyn has four planets in Capricorn creating a stellium in her 7th house of others. She has Uranus at 3 degrees 19 minutes, Saturn at 8 degrees 46 minutes, Neptune at 10 degrees 56 minutes and Venus at 22 degrees and 38 minutes. This combination in her chart is a little more potent with two outer planets (Uranus and Neptune) creating a dynamic mix with Saturn in his own sign of Capricorn. Mars is in Taurus in her 11th house along with Jupiter at 26 degrees 12 minutes, though Jupiter is peaking into the 12th house perched on the 12th house cusp at 27 degrees 43 minutes. Something to consider for her Jupiter so close to the cusp of the 12th house is imagine it is looking at things (or conscious attention) in the twelfth house but with her feet in the 11th of friends, dreams, and aspirations, as well as working with others in groups or associations. Taurus (most of Jaclyn’s 11th house) is where the essence of Jaclyn’s growth and expansion comes through but in the context and themes of friends, aspirations, and groups. The sign of Sagittarius is not on the cusp of a house in her chart, which modern/western astrologers call intercepted sign. We’ll discuss intercepted signs later in another writing. There are potentials of 12th house themes and she will understand how through reflecting on her life experience. Jaclyn’s Pluto is in Scorpio at 15 degrees 5 minutes indicating a deep transformation of her ego and creative self which sits in her 5th house. Pluto will demand underworld journeys of facing her shadow, as well as the potential to be challenging in some instances for those she may befriend. Pluto in Scorpio is seeking the deepest transformation through osmosis. There is a strong dynamic capacity for creative expression with the potential to express the darker side of life and the human experience. In reviewing her dynamic Pluto in her 5th house I wondered if Jaclyn appreciated Edgar Allen Poe or similar art forms where the intense, scary symbolism is apparent. Her own Sun and Mercury in the 8th house are both square to her Pluto in Scorpio. That aspect in her chart speaks of great tension with her own essence, her thoughts, and perceptions that are unique and outside the status quo and yet fixed and entangled in the Scorpio depths of Pluto in expression, creativity, and children. Sun in the 8th house and Mercury also speak to her being in a place of isolation, or perhaps exiled from others in her childhood, there’s also the potential for idleness as we’ve seen in other 8th house placements. Mercury in the 8th house is in a house that is not visible to the first house (the first house represent herself and her projection into the world and how she sees and understands herself). With Mercury in her 8th house her communication style, her perceptions may not always be easily discerned, but in her maturity, she would grow to know this more about herself as she experiences the mirror from others. Feedback from others that speak candidly with her would be invaluable to improve how she is perceived. Jaclyn’s moon in Libra is always seeking harmony and balance in the emotional part of herself, but also in her family, but often a Libra Moon native experiences anything but that desired harmony since there is always a balancing act between her own needs and those of her family. Her moon can see the first house from the 5th house, via wide orb in a trine to her Ascendant in Cancer. She has a connection to her own identity and her emotional sense of being in life and what she needs to feel that space of harmony in Libra. The key of Jaclyn’s evolutionary growth is viewed within her lunar nodes. Her south node is in Virgo, (considering the manifested, finite world) her experience and habits have been within the 3rd house of communications and siblings. Her north node is in Pisces in her 9th house of higher education, philosophy, truth-seeking, long-distance travel, and religion. The ruler of her south node Mercury is where she’s potentially struggled with communications, perceptions of both her and other people’s communications, especially with Mercury in Aquarius in the 8th square Mars in Taurus. (Mercury applying to the square with Mars shows this aspect has a higher dynamic of intensity too) in fixed signs also denotes a strong fixity with communications and opinions. Sun also square Mars and Pluto would feel isolated from the intensity of both Mars and Pluto in aspect by square (another important key for her identity (Sun) and self-awareness). Her Mars also can be her anger, passive-aggressive or too intense for others by how it is perceived, but any of these in the 8th house are most often projected or not visible to the individual until another person bravely confronts them or speaks about how they receive it from her. This is a key area of evolutionary growth, which will most likely be seen by Jaclyn through challenging experiences where she is perceived as too abrasive or intense for others in her communication style. It will be the area she may strive to improve, but it will be presented to her to master through repeated experiences. Fixed signs also tend to take a very long time to change. This evolutionary growth may appear in the family, through siblings, through her neighbors and community, as well as through groups and friends and even through being a student. The art of communicating intensity and directly but without abrasiveness to the listener is a mastered skill. Skills are a Virgo theme, bringing us back to her south node in her 3rd house of communications. One path for Jaclyn to grow is to find opportunities to be a better, more diplomatic communicator. This includes the listening part of the equation of communication and her ability to master the tone and style of her communications. Jaclyn’s north node in Pisces is in her 9th house. Higher education is one consideration for evolving, but also there’s some connection between higher education, foreigners or long-distance travel but the ruler of Pisces is Neptune in the 7th house in Capricorn, indicating by theme experiences of disillusionment and even a need for practical imagination or a practical approach to the infinite. Jupiter is also a co-ruler of Pisces, and in the 11th house comes together around her dreams, perhaps based on simplicity, home, comforts, basic life needs and yet in a bigger and more emphatic way. One way to understand your area of expansion is to view your Jupiter through its cycles every 12 years. This would give some insight into the ‘medicine’ for Jaclyn when feeling the challenges of her lunar south node in Virgo. Interestingly her south node is also in a trine aspect to her Uranus, Saturn, and Neptune in Capricorn. When I see this ease of flow between the south node and other planets it is like an open gate or an open door for that connection to work. Her south node in Virgo is at ease in the relationships of those very close and in her intimate circle, especially around Capricorn type duty filled relationships, not without some challenges of unexpected twists and turns (Uranus), but that she can find a proper place to use her intensity within her working relationships. Her friendships and her role in groups is where her communications and perceptions will be challenging, as well as some family interactions given the ruler of her 4th house is Mercury as well. Jupiter cycles are around age 12 and 24 and are worth exploring what were the most significant themes those years for Jaclyn. Friend related themes are a strong possibility, perhaps even being within groups related to home comforts, earth, gardens, beauty, and music, participating in clubs of what she values. Through observation of her past experiences, she gains a better understanding of her astrology working in her life. The work of astrology is gaining personal insight through studying your chart so as you move through transits of the present moment, you’ll have some understanding and wisdom for the patterns ongoing from your spiral of life, each progressing in its cycle to reveal the deeper truth of who you are and your aspirations for your own growth and healing. A key moment of awakening and change for Jaclyn when Mercury went direct by progression was January 26, 1997, just two days before her eighth birthday. Whenever anyone has a personal planet such as Mercury, Venus or Mars in the natal chart retrograde it is important to look in an ephemeris to count how many days past the person’s birthday that the planet went direct. That year is when that planet is key in the life of the person and the themes would be what house and sign that the planet is within the natal chart. It also is how that might be experienced with either significant challenge or with some support through other planets that may aspect the planet. When studying your natal chart across the life view, this is a valuable and a key consideration. One should always look in the ephemeris for what happens to Mercury, Venus and Mars especially 100 days after birth, do any of them go retrograde or direct during that 100-day span? The day after birth that they do change direction translated from days into years speaks of major moments in life. Mercury can start in a direct position, go retrograde and then go direct again within the life of an individual spanning over 30 years and will illuminate key themes for the individual who explores this part of their life story. With Jaclyn’s Sun and Mercury in Aquarius in her 8th house, she has a natural affinity for shedding light on knowledge to others that is occult, that which is hidden from plain sight, especially with the symbolic language of astrology and tarot. With the Sun and Mercury in her 8th house she would be very much like a receiver from the great beyond that just comes to her, just like some who have this kind of placement, much like a divine download of psychic awareness in some moments. She may get the knowing (mental Aquarius) about something in its essence without knowing where it came to her from and yet within her awareness, it has a pathway through to others. She may be a receiver which can be that “I just know, I don’t know how I know, but I just do,” type of experience. If she or others required evidence of how she knows she’d struggle with the who, what, where and why. That’s the Aquarius genius in her solar identity and through Mercury, it comes through her thoughts, perceptions, and communications. Jaclyn’s capacity to speak and articulate such hidden symbolism is one of her potential talents as she masters her style of communicating. 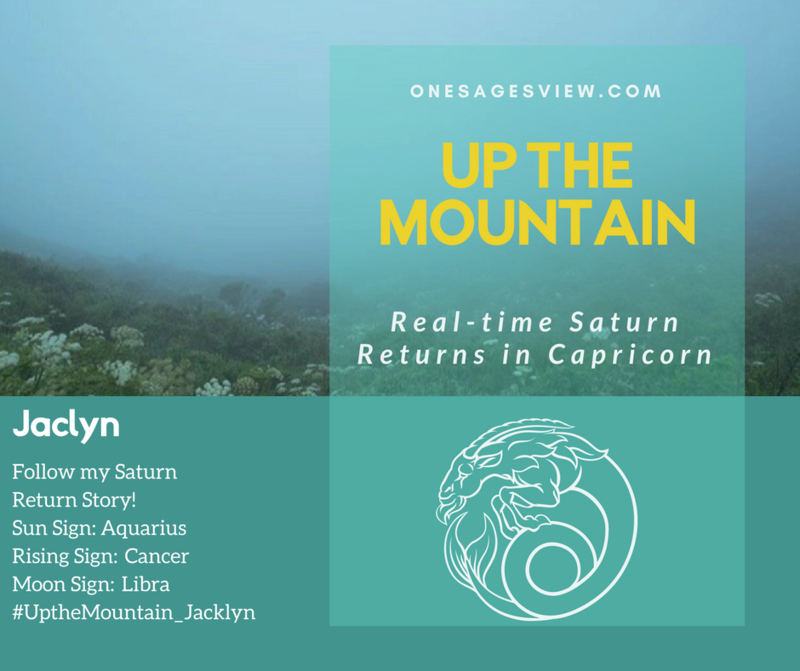 Jaclyn’s Saturn return in Capricorn is well in progress and the exact conjunctions for her occurred on February 27, 2018, May 9, 2018, and December 9, 2018. Because of her stellium in Capricorn, she will continue to experience her Saturn return in different themes as Saturn moves to conjunct her additional planets in Capricorn. Saturn is approaching her natal Venus now at 22 degrees Capricorn 38 minutes. Jaclyn shared that she feels very different from her parents in many ways. Her father a Scientologist and chiropractor and her mother helped in his business practice, both taught her to put herself first and the family first and not be a generous person. They shared that the more you spend physically or spiritually the less you have for yourself. She prides herself on not having followed them on their philosophy. She did not get a solid grounding on how to care for herself in early life. Her family was supportive of her exploring all religions and faiths, but at this point in her life, she wishes she had more structure from them early on for a foundation. She noted that her dad (and family) never traveled where Americans weren’t welcomed, but she enjoys international travel now in her adult life. She says it took her time to let go of that general mistrust she learned early on in life. She called it the insular life, the gated community theory, she’s been breaking through that thinking in her own life and the choices she makes for herself. She’s found herself envious of others who came from organized religions with a defined path like her Catholic friends. She’s learned to adopt her own and create something on her own along her journey. She sees the Aquarian influence of her parents with the Aquarian 9th house symbolism in her natal chart. She can see herself and others born near around the time she was born as redefining traditional views that have previously dominated in our culture. Jaclyn’s thoughts on the term millennial are that it is hyped for the individual, perhaps idealistic to a fault, and there’s a perception of laziness which is a negative view. Positively looking at her generation she sees them as a group of individuals trying to make life work with fewer resources and being extremely adaptable. She feels she’s adventurous, attempting to break down boundaries with things, as well as gaining from understanding through lived experience. She points out that it is overlooked about living day to day lives and how they go about choosing the work they do. One the more memorable life moments for Jaclyn in her international travels was most recently in Mexico, though she has traveled to Israel, Jordan, Sweden, Ireland, Scotland, England, Spain, Portugal, Cuba and throughout the U.S. She made a connection with a farmer and an environmental engineer on a kayaking trip. They took her camping on their chinampa (farm) on the Xochimilco and showed her the ancient channels the Aztecs used for transport (while in a canoe!). This moment was gifted to her by these locals and it is an ongoing connection they have maintained. She plans to visit them again this year in January and bring them supplies for the farm they cannot easily access. In this sharing, we see Jaclyn’s 9th house activated around travel and foreigners, but it also brings in Saturn (co-ruler of Aquarius ruler of 9th house) and her 7th house natal Saturn and her North Node that is in her 9th house. Our focus was on her Jupiter return, whereas Jupiter is in her 11th house of friends in the sign of Taurus (earth, money, but also could include friends who work the land or farmers!) It will be exciting to learn about her travels from this January in Part Two now that she’s deeply into her Saturn return. In Part Two we’ll see how Jaclyn’s life experiences in her Saturn return have shifted relationships and personal choices for her life, her work, and friendships. Saturn’s transit through Capricorn will conjunct her natal Neptune and Venus in the weeks ahead and then moving into a square with her natal Moon in Libra again bringing tension to her need for balance. We will see how the archetypes and symbolism bring her new insights for her ego expressed creatively in her life.